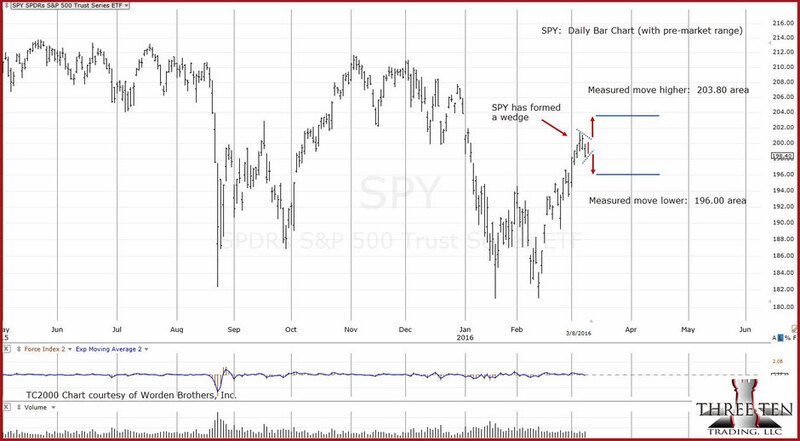 Last Monday the 11th, our assessment was that although the commercials were selling into this market at historic numbers, there was a possibility for a temporary head‑fake move higher before a significant reversal. Well, we have the move higher. Now let’s see if it holds. 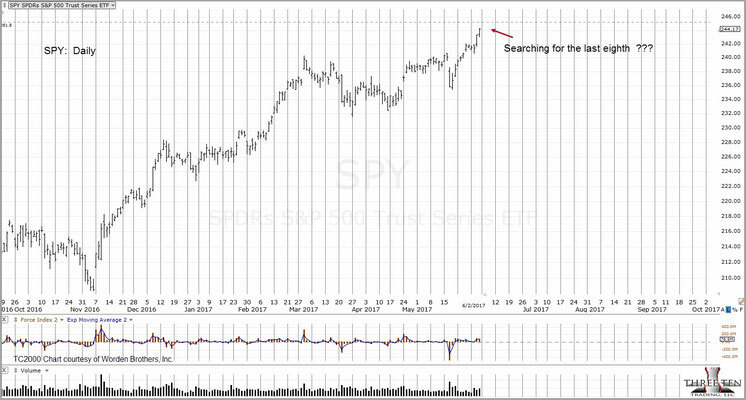 9/8/17: SPY forecast from July 6th, 2016 and result. The S&P is sub-dividing lower: Lower highs and lower lows. In the process of reversing and sub-dividing, the index has also revealed an axis line. That line in itself does not provide buy or sell signals. 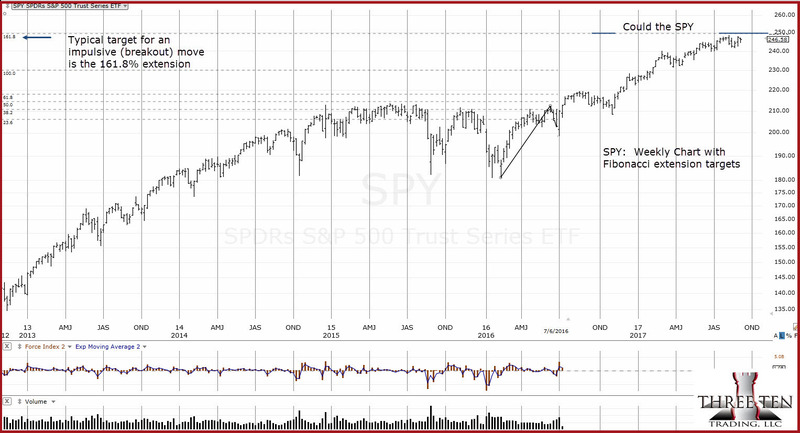 It serves to identify what area(s) the market considers important. From today’s action we see that price could not get itself back above the axis (two price bars equals one trading day) and sagged into the close. Not a good sign if going long is all you know. However, if going short is part of your repertoire, then it’s one more signal that this market is (currently) slip-sliding away. The dollar continued its decline and is approaching support. We’re standing by for the “Dollar collapse” theatrics. Of course, it really could happen this time. Gold continues to grind higher … slowly. 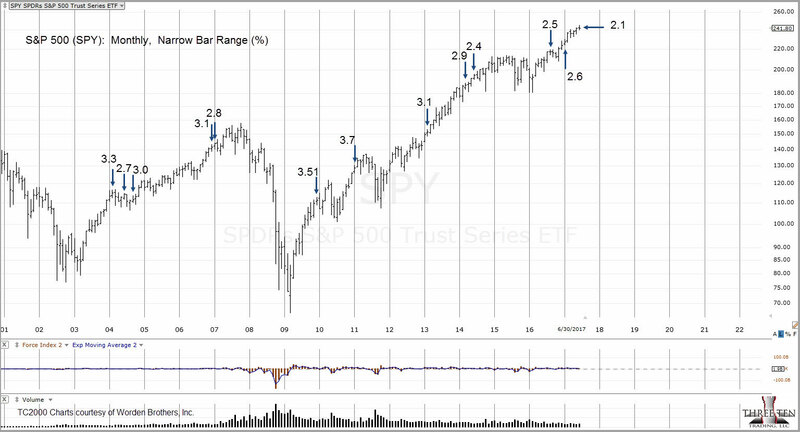 Updating the S&P chart from August 5th, we see the century old Wyckoff analysis provided the answers to probable market direction. Just two trading days after the update on the 5th, the S&P 500 reversed. Go to the Sector Archive at this link to see both charts side-by-side. Use the right arrow to toggle between the graphs. That answer is in price action itself. 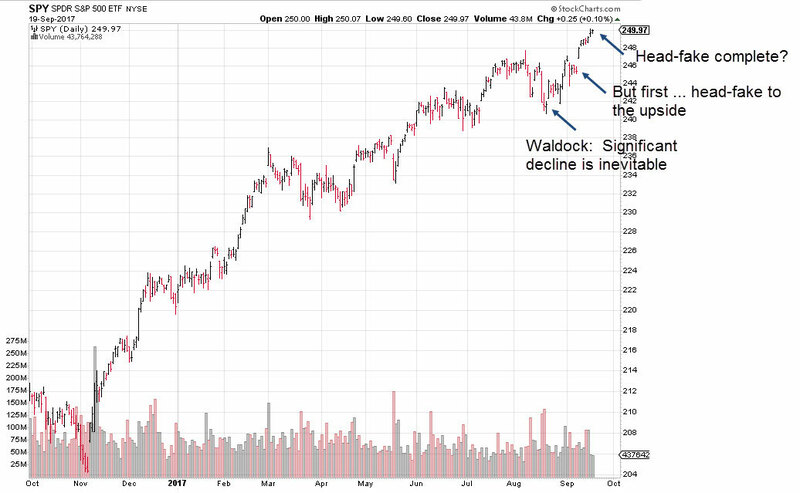 At this juncture, it seems unlikely that there will be new highs … what’s more likely, is continued sub-division lower. SPY: August 5th through August 11th. ZeroHedge reports the S&P has closed in an 11-day series that's the tightest range in history. What does that look like on a weekly chart, closing basis? The attached chart shows that upward SPY progress and retracements have ground to a halt. The mid-June report had 'investors' jumping in at a funding level near the amount posted during the November ’16 rally. As indicated in that report, the market had gone flat. All of that inflow was not able to move prices higher. Now the month is complete, we can see that it's the narrowest range month in nearly seventeen years and possibly going all the way back to December of 1993. In addition to the narrow monthly range just posted, the S&P (SPY) has reached a Fibonacci projection target off the 2009 lows. This target level was previously reported on June 3rd. 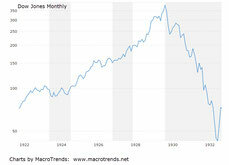 A Fibonacci target has been reached, volatility (VIX) is at historic lows, monthly range (SPY) is at its lowest point in decades and huge fund inflows have resulted in no appreciable upward progress. The situation appears to be clear: There has been ample time to exit longs and (if desired) launch a campaign to establish positions on the short side. Nearly a century ago, back in the day when prices were in fractions (1/8, 1/4, 3/8, 1/2, 5/8, and so on) Livermore discussed the fortunes that were spent attempting to find that “last eighth”. 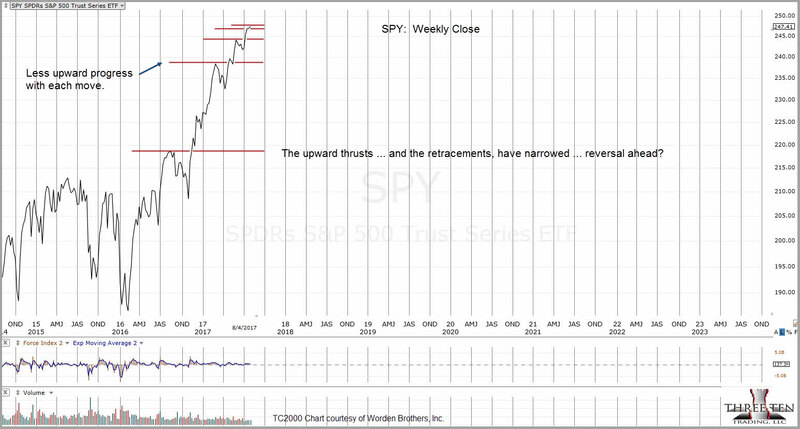 We see how the S&P is respecting the Fibonacci levels shown on the weekly chart. 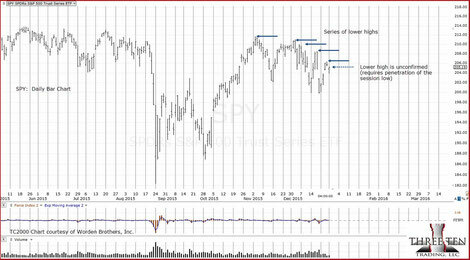 Zooming into the daily chart (located in the sector archive), it shows the SPY is very close to the next Fibonacci level. Will it ever get there … will it reverse immediately … just where is that last eighth? Our (corporate) position on the market is clear: We’re in the surreal environment of fiat currency, a decades long era (since 1971, to be exact) of fomented prices, end of the debt based model, along with the attendant day to day end-game positioning. We do not, and have not entered “long” on anything for some time now … unless it’s an inverse ETF. Our trading actions have been to enter short 99% of the time. That trading approach is based on our market assessment above, which is also backed up by other professionals (Stockman, Barnhardt, (time stamp 2:09:10), et al. ): In a nutshell, this market could gap down 30% - 50% literally overnight, without warning. The reason for going the option route has been stated in previous updates but in its simplest form, the Options Clearing Corp (OCC) is headquartered in Chicago, not Wall St. They already have provisions in place in the event of a market closure. In effect, the option trader has a very good idea of how options clearing will be handled during an instantaneous market closure for whatever reason. In our opinion, these are the issues that should be foremost on any money manager or trading individual’s mind … not how to buy the next dip or how to stay long until the signal is given to get out. 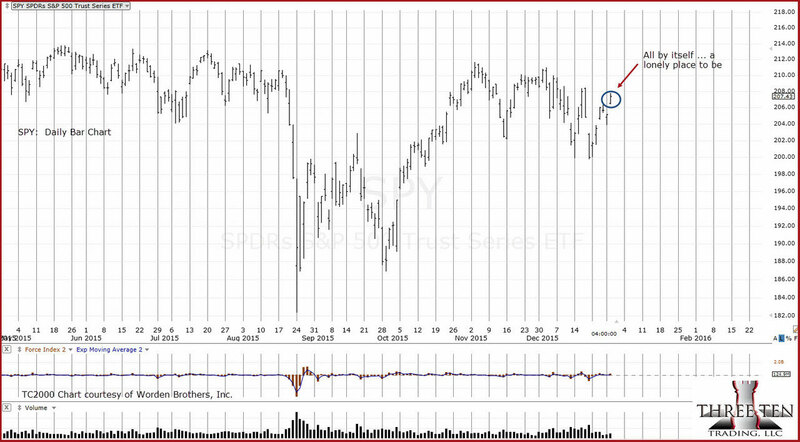 The “signal” may be the 30% - 50% overnight drop as previously noted. How is one going to get out of that type of event? Just think about that 1,000 point down day back on Monday, August 24th 2015. There were literally hundreds of trading halts during the early hours of that session. 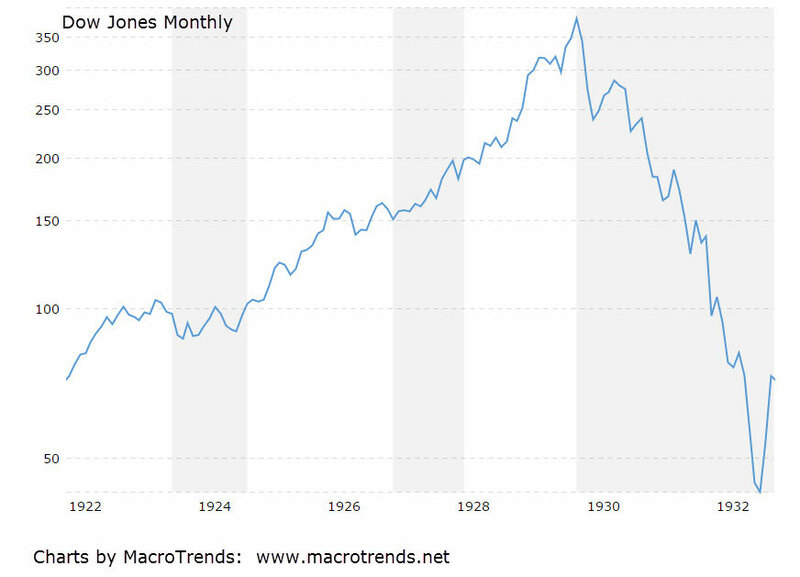 What if the market was not down 1,000 points, but 5,000? Would it even be open for business? If that was the case, the options trader would know where he stands … it’s detailed in the OCC documentation. One might be inclined to think that an instantaneous 30% - 50% drop can’t happen. It’s never happened before, right? Well, we can come up with a whole list of events that never happened before; that is … until … they did. Our corporate schedule has loaded up over the past several weeks. Therefore, on a go forward basis and until there’s sufficient time available, there’ll be no market analysis posted; only the results of closed trades. Of special note, is the mocking tone that is Wikipedia. I wonder how the Wikipedia “scholars” would explain this (flood theory) and this (remote location evidence of flood), and this (ark location). That's a lot of data, physical evidence and theory for something that never happened and that Wikipedia labels a "myth". When “the day” comes, it’s too late to take action. 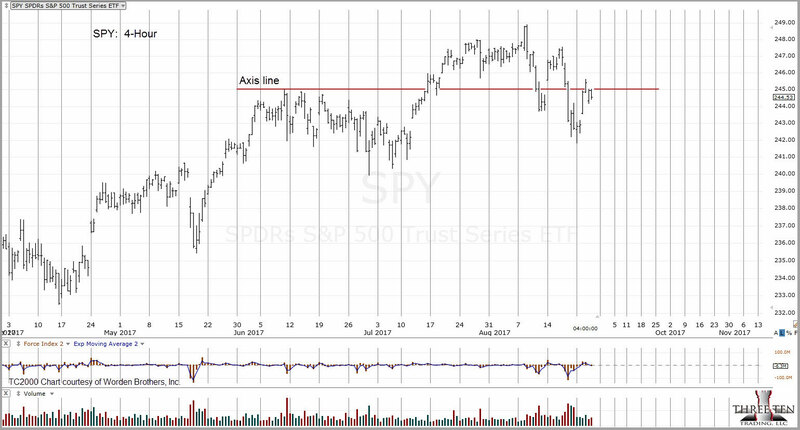 Having determined the structure of the market was different (9/12/16) from the prior two rebounds and now with it being obvious; the question becomes what is probable at this point? 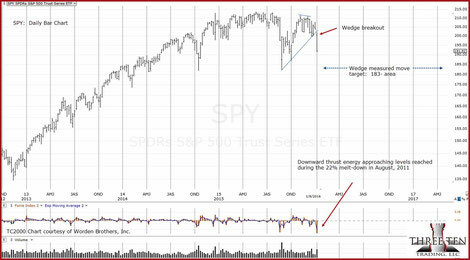 Looking at the daily SPY, there appears to be a wedge and ‘throw-over’ which lasted about two months. Typically, a throw-over will take a day or two … maybe a week. 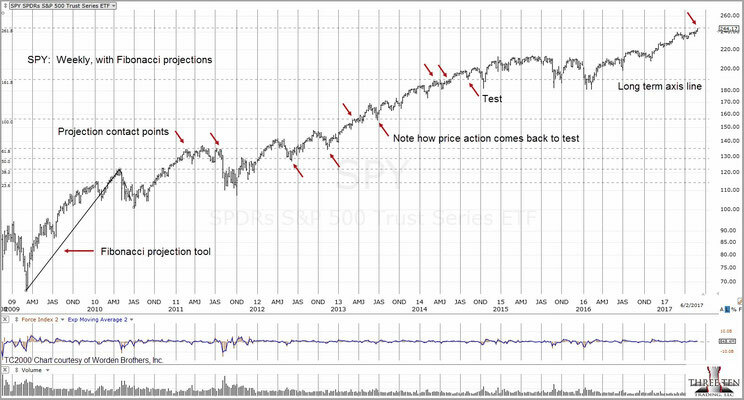 However, we are at the extreme of extremes with the market behaving (being stretched) accordingly. A change in structure tells us what happened before, is an unlikely next. It does not tell us what is probable. 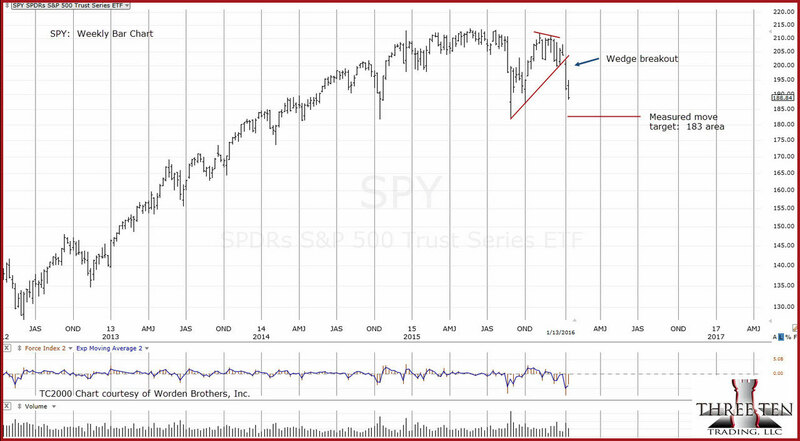 Unless there is overt manipulation that could come in at any time, the current set-up is bearish. Even if we do get manipulation, it may take time to change the market character from bearish back to bullish (again) … potentially, enough time to recognize it and position accordingly. Price action has entered the confines of the wedge: probability favors a move to the lower boundary at some point. If and when that happens, we’ll be on the lookout for congestion (hesitation) above, or at, or just below the lower trend-line. 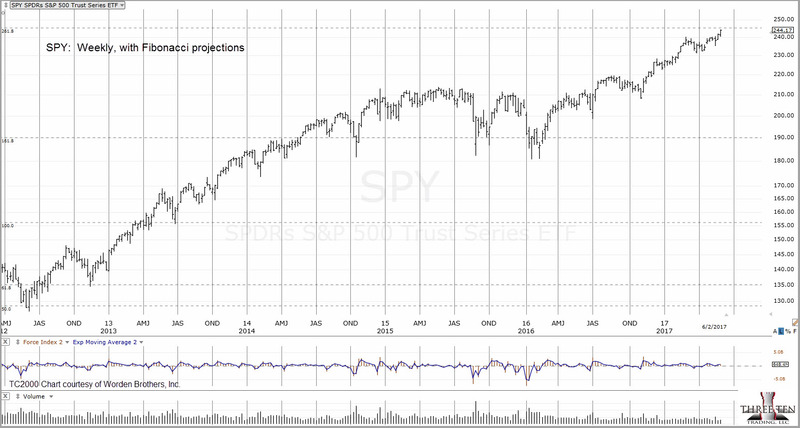 One of the key Wyckoff tenets is to look at how much time the market is spending in a particular area. Time helps define the direction of trend. More time equates to more pressure. Pressure equates to direction. While the S&P made a new print high at the last session, it failed to close at a new all‑time high (ESU16). 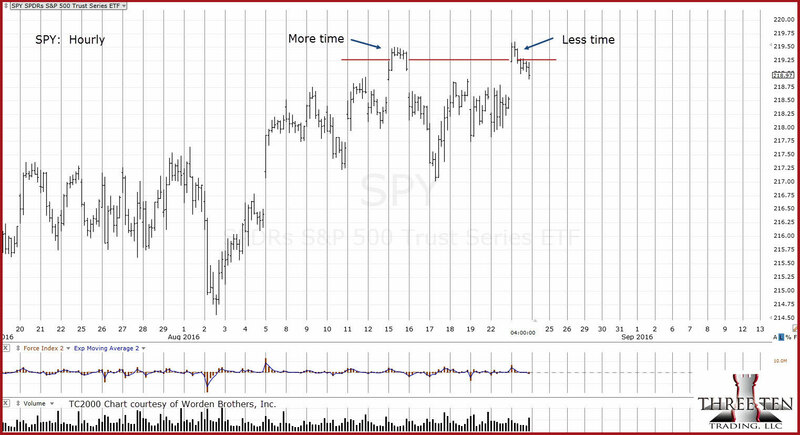 In addition, we can see at the highs, there was less time spent before retreating to close lower. The structure of the S&P on a daily, weekly and monthly time frame looks exhausted … eking out one marginal new high after another. Now, there was a new high without a higher close. The index may indeed keep grinding, clawing and scratching upward. However, the structure of the market itself (admittedly, subtle at this point) indicates the potential that we have seen a top and are now moving to lower levels. 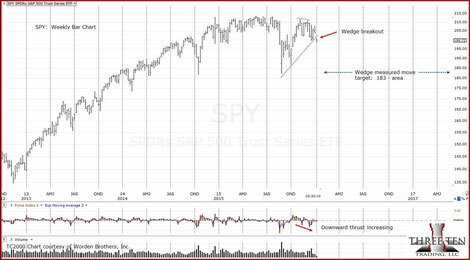 Price action in the S&P weights probability to an up‑side breakout. 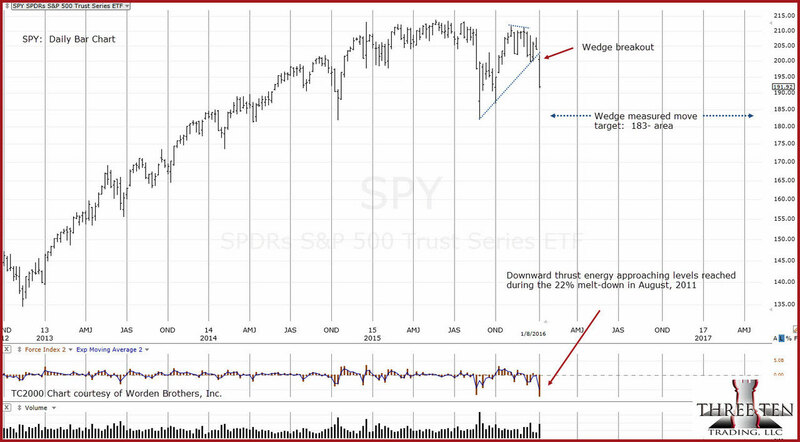 The SPY charts at this link show two separate methods for upside targets should a breakout occur. Interestingly, both methods provide the same target. If there is a breakout, we're not thinking it’s 1995 and a new bull market. We have an opposing view. 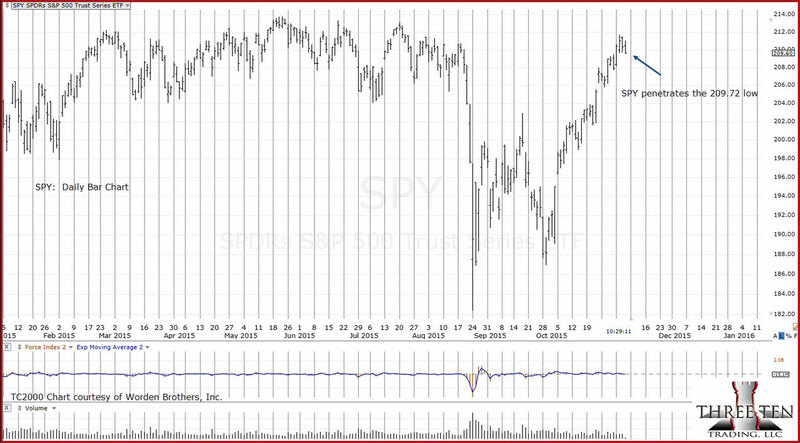 The historic chart (top insert) provides data on another similar time in market history. Note the sideways action in the spring and early summer of 1929. That action was followed by a breakout to the upside. Price action continues to move nicely to the target area. 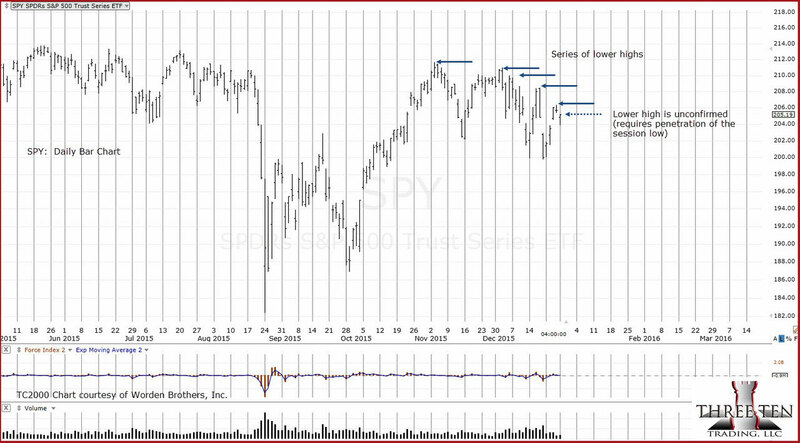 How SPY behaves if/when it gets to the 183 area will provide clues if there is more downside ahead. The wedge breakout is progressing as expected. The measured move remains at the 183 level. However, there appears to be a much stronger move in-progress. The SPY looks to have established (or beginning) a trading channel. If this channel is in effect, we may be in for yet another unprecedented event in the market. 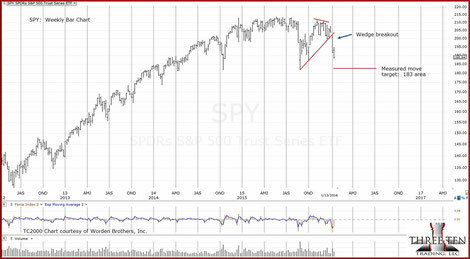 The SPY has penetrated the bottom trend-line of a wedge pattern as shown. The measured move is to the 183 area which is near established support levels. 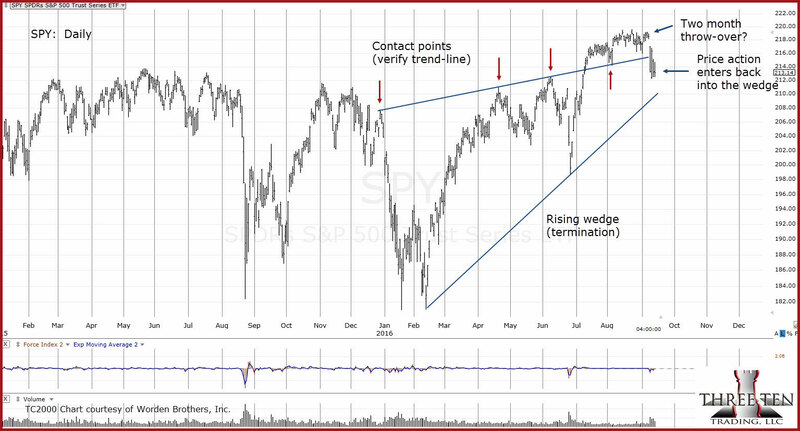 The index has other technical factors at this location that indicate substantial downside ahead. Read more. The SPY pushed up into an area that is has not seen for over a week. A lonely spot to be if there is no follow through. This location may have yet another connection to an on-going Fibonacci time sequence. 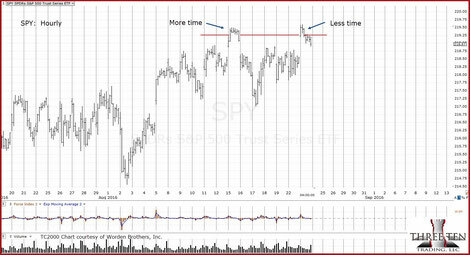 A penetration of the 206.47, low and a subsequent move lower would indicate that this "breakout" is in trouble. The S&P continues to ratchet lower, heading into the year-end. The market is exhibiting unusual characteristics that so far have been effectively hidden from mainstream analysts. What appears to be a modest on-going correction is actually shaping up to be something much more sinister. If price action continues to maintain its current structure, we may penetrate the mid-December lows by the end of the week. The SPY has penetrated the 209.72 low. 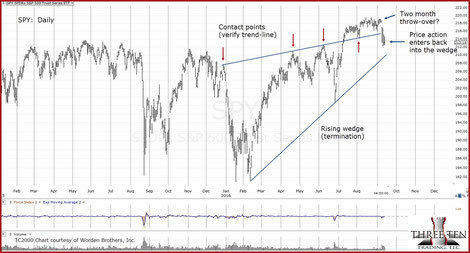 We can consider the corrective move higher complete. The index appears ready to reverse. Forecast and additional detail here.